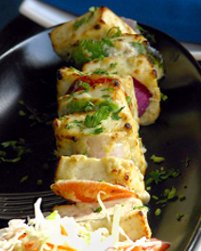 Indian Cuisine Tutorials: Punjabi Cuisine - Paneer Tikka - Simply Fahad-istic! This is Post No. 10 in Indian Cuisine Tutorials series.A new one each day! 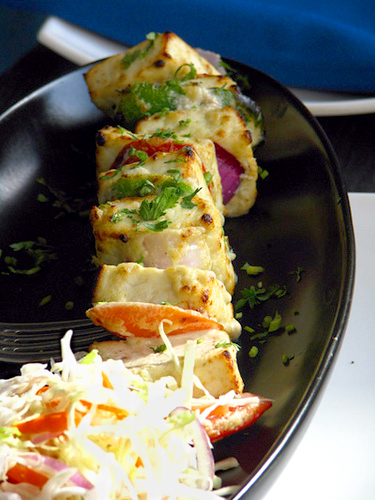 While meat lovers enjoy chicken tikka,vegetarians don't have to feel left out.The vegetarian version,called Paneer Tikka,is immensely popular in most of the country. Cubed pieces of paneer,the fresh,unsalted Indian cheese are marinated with almost the same ingredients as chicken tikka - yogurt,ginger paste,garlic paste,red chili powder and salt.Some cooks also like to add ground spices like cumin seeds,coriander seeds and pepper for additional flavor.Turmeric is often added to give the preparation an appealing yellow color.After marination,this paneer is skewered with even-sized pieces of onions,tomatoes and capsicum,then cooked in a hot tandoor till tender and slightly charred.Like almost every tandoori preparation,it is served sprinkled with chaat masala.Lemon and green chutney are served on the side.